Resource management games walk a fine line between frantic fun and tiresome tedium. Allowing the gamer to progress at an acceptable pace with a healthy dose of creativity, it can be a tremendously satisfying experience. On the other hand, if the player is simply moving resources from one bucket to another, waiting eons for some sort of reward, the novelty tends to wear out quickly. 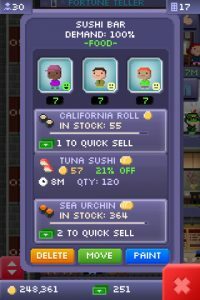 Fortunately, Tiny Tower from NimbleBit has a nice, steady flow to it, with plenty of rewards for savvy players. 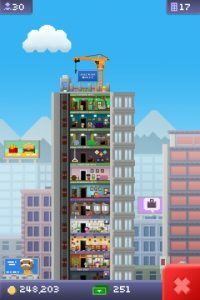 And with its intuitive interface and charming pixel-art graphical style, Tiny Tower is a welcoming and enjoyable game that will provide hours of entertainment as players attempt to turn their “tiny” towers into bustling skyscrapers. 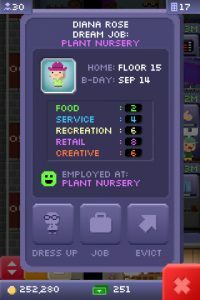 Tiny Tower begins with a very brief tutorial, giving players that absolute minimum information before throwing them into the action. Fortunately, the interface and menu design is so clean and self-explanatory that it won’t be long before you’re building new floors, moving in tenants, buying supplies for your commercial, and more. 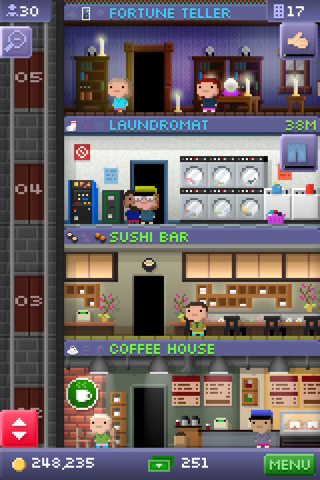 You see, Tiny Tower isn’t just about stretching your building toward the sky. You also must manage nearly every detail inside of the building. You’ll house tenants, employ them, stock the businesses, operate the elevator to move visitors from floor-to-floor, and much more. In order to make things easier, players earn currency, which they can use to speed up certain tasks like restocking shelves or the construction of floors. These funds are especially handy when you feel like you’re just sitting around waiting for something to happen. Tiny Tower looks great and takes advantage of every inch of the iPhone’s screen. The pixel art is a charming fit for the game, giving it a clean aesthetic. And your tower itself takes up the entire screen, with no space wasted for menus, messages, or icons. In addition, if you’d like to get an overall view of your tower, you can simply hit the “zoom out” button to see how your creation fits in with the skyline of the city. 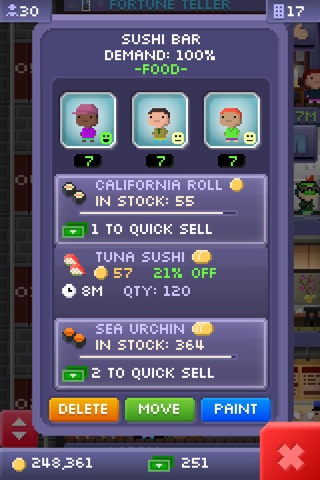 Bottom Line: Tiny Tower is a terrific little game, hampered only slightly by rare moments of tedium. Tiny Tower is compatible with iPhone, iPod touch, and iPad. Requires iOS 3.0 or later.